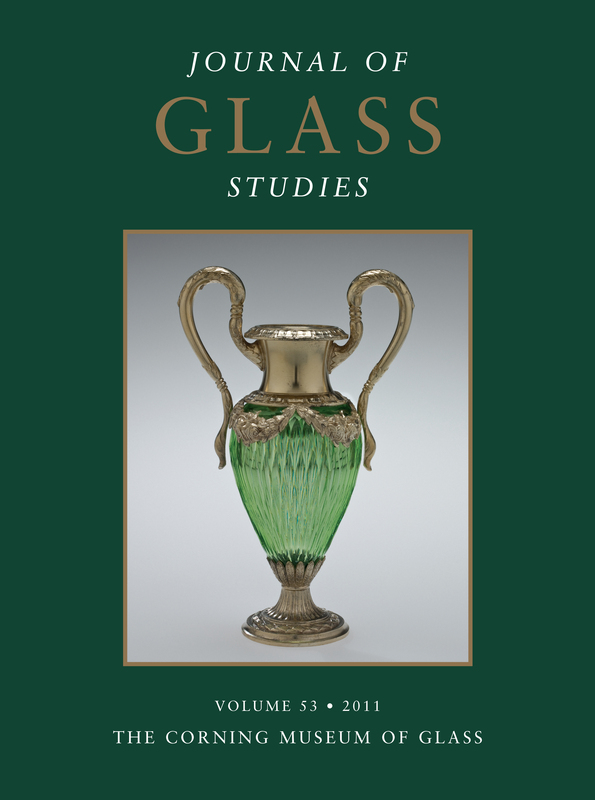 In this volume, Birgit Schlick-Nolte, Rainer Werthmann, and Christian E. Loeben examine a glass statuette owned by Pharaoh Amenhotep II as well as other early Egyptian glass inscribed with royal names; this glass is fairly precisely dated to the 16th and 15th centuries B.C. Also, Aileen Dawson looks at French glass in the British Museum collection, and Chloe Chelz studies the work of Pietro Chiesa and the glass of Italy between the world wars. Inscribed glass artifacts from the 16th and 15th centuries B.C. are rare. Generally, they are well dated by royal names and were made with techniques that were most refined during the reign of Amenhotep II (1428–1397 B.C.). Three outstanding statuettes have cartouches of this king on the upper right arm: two green monkeys (glass or vitreous material) and the hybrid goddess Taweret (glass). The last of these is the most sophisticated Egyptian glass statuette and the only precisely dated work of its kind. Analysis of the statuette of Taweret showed that the glass was melted from powders without being stirred. The blue glass is colored by cobalt, probably from the alums of the Western Oases. The yellow glass is colored by particulate lead-antimony oxide, the lead probably from the Eastern Desert. The remains of the core material are very rich in phosphates. Based on the lead-isotope analyses reported here, the Taweret statuette may have been produced in the glass workshop where glass artifacts from the tomb of Amenhotep II were made. An extremely rare set of cast colorless luxury glass vessels was discovered in a tomb in the ancient city of Akrae, near the village of Lithovouni in Aetolia, western Greece. These vessels are dated, on the basis of the other grave goods, to the late fourth to early third centuries B.C. Three of the objects—a cylindrical vessel, a pouch-shaped cup, and a discoid lid—are parts of a spool-shaped container that functioned as a psykter. This set is unique in pre-Roman glassmaking. It appears to have been specially ordered by its owner, undoubtedly a wealthy individual who may have lived in one of the glassmaking centers of classical Greece. However, precisely where these vessels were produced is unknown. The Italian peninsula is of great significance for the occurrence of mosaics with vitreous materials, but the history of glass in Roman mosaics has never been investigated comprehensively. This article traces the development of the use of glass and other vitreous materials in Italian floor and wall mosaics dating from the late second century B.C. to the late first century A.D., from the earliest employment of vitreous materials to the full use of glass tesserae in mosaics. Particular attention is paid to faience, Egyptian blue, and sealing-wax red glass, materials that were used for only a short time. The chronology and the technology of these materials is considered in relation to eastern and southern Mediterranean mosaics and the history of glass technology. Some cage cup fragments were discovered during the excavation of the Eglise Saint-Laurent, an early Christian church in Grenoble, France. These fragments came from a cup that was broken before it was completed. Several aspects of the fragments—the upper border of the network, the position of the bridges, and the texture of the surfaces—were studied in a comparative analysis of the two predominant h­potheses regarding the manufacture of cage cups. It was possible to demonstrate that the vessel from Grenoble was made by grinding a thick-walled blank, thus confirming the hypothesis supported by the frequent experiments of Josef Welzel. Small glass imitations of emeralds were produced and used in great quantities. Larger imitations (in different shapes) had been kept in some church treasuries since the Middle Ages. They were well known and important because of their symbolic meaning or as relics, and they were also quite valuable because they were thought to be precious stones of considerable size. Some of these were lost over time, and all of the surviving examples were identified as glass about 1800. Thereafter, these replicas were preserved only as parts of objects (e.g., on the Servatius reliquary in Quedlinburg), as curiosities of historical value (e.g., the Emerald of Charlemagne in Reichenau), and as highly valued relics and unique and beautiful glass vessels (e.g., the Sacro Catino in Genoa). French glass production from the Renaissance onward deserves more attention. In recent years, a series of archaeological studies and several articles have concentrated on domestic glass and bottles, as well as enameled glasses of the Renaissance with religious or dedicatory inscriptions. However, French glass in most museum collections has remained largely unpublished. This article presents an overview of French glass from the mid-16th to mid-19th centuries in The British Museum, a collection that was assembled mainly in the mid- to late 19th century. Attributions to glasshouses, or even to regions, remain problematic, and only a wide date range can be proposed for the production of many pieces. Among the glasses presented here are several for which the author seeks parallels for comparison and further discussion. Two green vases with bronze mounts are preserved in Pogliaghi’s museum at the Sacro Monte Varese. The discovery of some documents in the Archivio Segreto Vaticano allows us to relate the vases to Pope Paolo V Borghese (1605–1621) and to his chapel in the Church of S. Maria Maggiore in Rome, where they were displayed. The gift of these vases to the pope was made by the bishop of Gaiazzo in 1612. This date has also been applied to similar glasses that many scholars attribute to the Medicis’ glass furnaces. Documents and iconographic sources from the beginning of the 17th century suggest a connection between these glasses and the Medicis’ glass furnaces in Florence and Pisa. The glasses are depicted in paintings by Jacopo da Empoli, Tiberio Titi, and Giovanni Benedetto Castiglione, and in a drawing ascribed to Jacopo Ligozzi’s studio. These works of art, which came from Florence, date from the early 17th century. Documents from the Gonzagas’ archive in Mantua show that these colored glasses were part of their collection as well as of that of the Medicis. Giuseppe Briati was the most famous Venetian glassmaker of the 18th century. The Most Serene Republic gave him the unique privilege of having his furnace in the city of Venice, thereby making an exception to the law of 1291 that effectively restricted all glassmaking to the island of Murano. At a time when the Muranese industry felt the effects of competition from various European countries, Briati’s contemporaries praised him, above all, for his chandeliers and deseri (desserts). This has led to the belief that all surviving objects of this type came from Briati’s furnace. This is an exaggeration, just as it is an exaggeration to suggest, as some have, that Briati did not know how to work glass and that his fame should be attributed solely to his marketing skills. This article attempts to reassess Briati’s position by referring to the many (although often imprecise) archival documents that survive. Early in 1885, Arthur Pabst published an article titled “Chinesische Glasarbeiten” in Kunstgewerbeblatt, in which he described the collection of Chinese glass donated by Max von Brandt to the Kunstgewerbemuseum in Berlin in 1879 and 1884. In April 1885, Emile Gallé spent two weeks in Berlin studying this collection. Today, these 99 objects provide insights into the stylistic influences on Gallé’s work. The French artist was first noted at the Paris world’s fair of 1878, and he received the Grand Prize at the 1889 fair in the same city. This success can be linked to Gallé’s observations in Berlin and the resulting design ideas, which include the use of opaque colored glass, encased glass, engraved marquetry, and vessels with a separate base. Several Chinese motifs and vessel shapes were also part of Gallé’s repertoire. In addition to adopting iconography and forms on the basis of his studies in Berlin, Gallé developed his characteristic engraving and “patina on glass” techniques. This article discusses the career of James Humphries Hogan and his designs for blown table glass. For 50 years, Hogan worked for James Powell and Sons (later, Powell and Sons [Whitefriars] Ltd.) in London and Wealdstone, Middlesex. Whitefriars is known both for its ecclesiastical stained glass windows and for its fine and everyday glassware. Hogan began his career as a drafter in the stained glass workshops in 1898, and he later became a principal designer there. Although he tried his hand at designing a single champagne glass in 1912, he did not design table glass again until about 1932, and from that time he designed a considerable amount of glassware for Whitefriars. This output included both modern and traditional types of glassware, either partly or completely blown, including one-off and affordable, utilitarian pieces. Hogan also participated in several design societies and wrote articles on glass in modern society for design publications. This article presents a case study of Pietro Chiesa (1892–1948), contextualizing both his traditional work in stained glass and the lighting designs he created during the 1920s and 1930s, integrating them with Italy’s evolution from craft to industrial production. From his origin as a master of leaded glass works, designed both independently and in collaboration with others, to the flowering of a career in lighting design as the artistic director at Fontana Arte in the 1930s, Chiesa demonstrates a shift in the vocabulary of modern taste, with glass as a central signifier. The formal characteristics of his work and its promotion to a national and international audience reveal the designer’s involvement with this shift, and illuminate a significant period in the history of Italian modernism. “The Winter Does Not Pass through Me, but the Sun Sparkles within Me”: A Literary Window on Roman Glass?